"This is a man's world, But it would be nothing, Nothing without a woman or a girl"
Busted Stuff (2002), The Best Of What's Around, Vol. 1 (compilation) (2006), Live Trax Vol. 3: Hartford, CT August 27, 2000 (this album) (2005), Live Trax Vol. 6: Boston, MA July 7-8, 2006 (2006), Live Trax Vol. 11: Saratoga Springs, NY August 29, 2000 (2008), Live Trax Vol. 22: Scranton, PA July 14, 2010 (2012), Live Trax Vol. 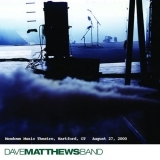 26: Marysville, CA July 30, 2003 (2013), Live Trax Vol. 25: Maryland Heights, MO May 30, 2006 (2013), Live Trax Vol. 40: New York, NY December 21, 2002 (2016).